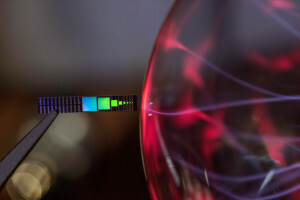 Researchers from Sandia National Laboratories (USA) have developed a small device, based on silicon, that can use waste heat to generate DC current. The new method was developed mainly to recover energy from waste heat (infrared radiation). One application, for example, is to use engine heat and convert it into electricity for a hybrid vehicle. The device is made from a combination of aluminium, silicon and silicon-dioxide, and collects the heat, channels it and converts it into electricity. The top is made from aluminium with very thin etched stripes that serve as an antenna to collect infrared radiation. Between the aluminium top and silicon bottom there is a very thin layer of silicon-dioxide. This layer is about 20 silicon atoms thick, or 16,000 times thinner than a human hair. The aluminium antenna with the striped pattern, channels the infrared radiation into this thin layer. The infrared radiation that is trapped in the silicon-dioxide causes very fast oscillations of about 50 trillion times per second. This process, also called rectification, generates a DC current. In the short term the researchers are interested in making a compact infrared power supply, potentially replacing thermo-nuclear generators that use radioisotopes (RTGs). These nuclear batteries are used, among other places, to power sensors in space missions that do not receive sufficient sunlight for solar cells to be effective.